Hey guys! I am THRILLED to be participating in an Academy Awards-inspired blog party with 7 of my favorite blogger friends! I am a huge movie buff, and every year, I attempt to see as many of the Academy Awards Best Picture nominees as I can. This year, I took my hobby to the next level and teamed up with 7 other bloggers to bring you a total of 8 party-appropriate recipes – one for each of the Best Picture nominated films! Let me make one thing clear: American Sniper is not a film about food. Not in the least. But I was inspired by one scene in particular, which involved a group of people gathering over a table full of delicious-looking Middle-Eastern food. 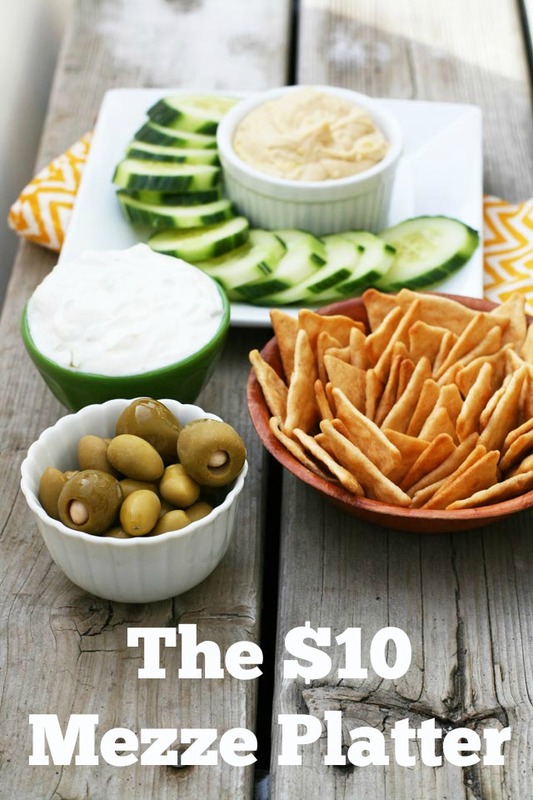 Sticking to my cheap recipe theme, I came up with a mezze platter – a selection of dips and small bites that is often served as an appetizer course in Mediterranean and Middle Eastern countries – for less than $10.00. You truly don’t have to spend a lot of money to create a great appetizer platter. I’ve done this before with my $10 Cheese Plate and $10 Appetizer Spread. Now you have an excuse to throw an Academy Awards-themed party – and you have 8 party-ready recipes to choose from. Even better, get your friends to join in and each take a recipe. This could be the greatest party of your year! For more cheap recipe inspiration and notifications of fun blog parties like this from time to time, please follow me on Facebook and Instagram. Thanks for including me in this project! I had a blast! I will definitely be making your affordable platter next Sunday. This is absolutely one of my favorite types of food to graze on. Haley. You Rock. Your platter looks phenomenal- nothing beats a Greek-esk tray of food in my mind (olives are pretty much pickles in my heart). Thank you so much for putting all your time and energy into making this happen- I would say it was a rip-roaring success and it couldn’t have happened w/o you! Love this! It’s so nice to be reminded of great ways to host that don’t cost a ton of money. And this is definitely a great choice for American Sniper! You had me at roasted garlic hummus. Looks absolutely delicious, and again, I’m so glad I got to be a part of this little project!